The RT trench roller with the SC3 infrared-remote control offers proven compaction results with safer operation. The smart control uses an infrared signal with line-of-sight control. The machine stops moving and vibrating should the line-of-sight be lost or if the operator comes within three feet (one meter) of the roller’s receiving eyes with the control box. The articulated trench roller offers below the axle exciter in each drum to allow for the efficient transfer of compaction energy to the soil for superior compaction results. Available with the choice of Kohler or Kubota engine. 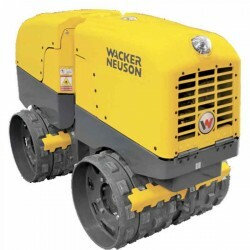 Smart trench rollers for tough compaction applications.Wacker Neuson's articulated trench rollers fe..